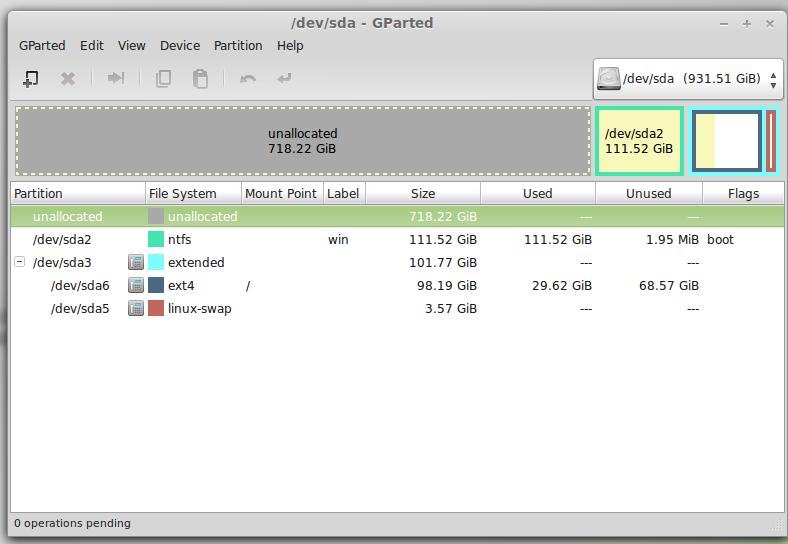 where /dev/sda2 - Windows7 and "unallocated" is the partition I want to add to my current Linux installation at /dev/sda6. But I can't do this for some reason. Even when I format unallocated partition and then I click Resize, I can only make it smaller. The same thing is true for /dev/sda6. In other words, /dev/sda1 and /dev/sda6 don't see each other. So how can I merge /dev/sda1 into /dev/sda6? Clicking on /dev/sda3 and choosing "resize"
To merge 718 GB unallocated space with the /dev/sda6, you have to follow the below steps. 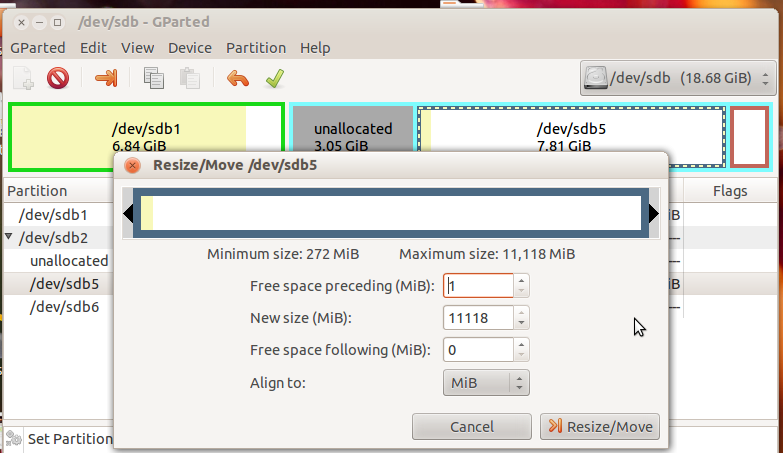 First boot from Ubuntu live disk and mark sure that all the partitions are unmounted.Gparted won't resize a mounted partition. Now right-click on the /dev/sda2 partition and click on resize.Move the dragger to the extreme left, so that the unallocated space will come just below to the /dev/sda2 partition. Right-click on the extended partition (/dev/sda3) and select Resize option.Now you can be able to add the unallocated space to your extended partition. Now the Unallocated space will comes inside your extended partition ie, just below to the /dev/sda5 partition. Right-click on the /dev/sda5 partition, select Resize option and move the dragger to extreme right.So that the unallocated space will come just above to the /dev/sda5 partition. 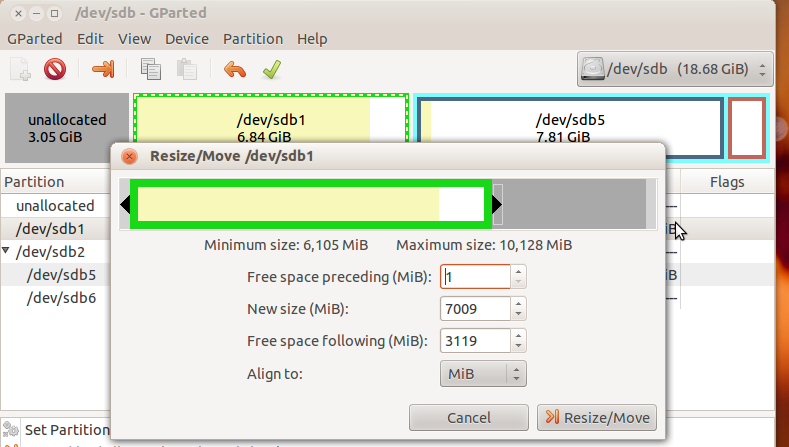 Now you can be able to resize your /dev/sda6 Ubuntu partition. a - It appears that you are booted up onto that specific hard drive at the moment. You cannot modify partitions when you are currently using that drive. To remedy this, boot into a live USB (using your Ubuntu Install disk). 1 select sda2, and move it to the left (using the partition menu>move). Note: There will be an error that pops up, warning you about failure to boot, this is normal! 3 Select sda6, click resize, and add the unallocated space to sda6. Now what you want to do is click the green checkbox to apply the changes. This will take a long time! Either way, you need a Live CD/USB stick to boot off of. I found pretty detailed instructions here. The first method is easier (but you need to have a live CD of ubuntu 12.04 or later, and have internet access), but the second method (via terminal) works too. Just follow the instructions, and feel free to ask any questions! You can not merge partition. Unallocated partition is without file system and must be formatted before usage. Your /dev/sda6 is logical partition on primary partition /dev/sda3 and can not be bigger then host partition /dev/sda3 without space for /dev/sda5. Solution is to move partition /dev/sda2 on beginning of disk. After that to move and resize partition /dev/sda3 to max space. And at the end resize logical partition /dev/sda6. I'm not sure, maybe work. Best of all is to backup data and do fresh install of booth system. Not the answer you're looking for? Browse other questions tagged 13.10 partitioning gparted merge or ask your own question.